For a kid growing up in Southern Ohio — Bible belt country — the sound was both alluring and repellent. "What's your mother doing?" my friends would ask. "Being a weirdo," I told them. And so encapsulates the coming of age story of Sasha Brown, a transplanted tween plunked in the middle of the Bible Belt with a macrobiotic hippy mom and a ribs-eating dad. A writer whose work has appeared in The New York Times, Redbook, and Cosmopolitan, Brown's prose is heartfelt and hilarious, revealing her quest to find her way as two worlds collide. While other moms were at Bible study, her mom was studying Sanskrit; while other were finding friendship at Tupperware parties, her mom was finding enlightenment at the ashram. And when her mother was diagnosed with breast cancer, she chose a healthy diet and yoga over aggressive chemo. When her mother died, Brown ran as far away from yoga as she could until a running injury left her needing the very thing she was running from. It was there—on the mat—that she processed her grief and found her mother again. As she went deeper into the poses, she discovered she was more like her mother than she thought. Through it all, she found a deeper understanding of the practice, of the breath, and of the life her mother lost too young. The practice that once seemed easy and slow compared to pounding the pavement in a new pair of Asics became the biggest challenge of her life. She learned that yoga is so much more than asana. So much more than breath. So much more than perfect poses. The "union" of yoga became one of heart and mind, and finally, with that maternal energy Sasha had been missing for so many years. In the space that she focused her mind and pushed her body to its breaking point was where she would see her mother. In the space of her yoga mat, she and her mother connect across time. 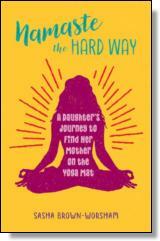 Namaste the Hard Way is an ode to the timeless bond between mothers and daughters.